Coal-to-gas conversions are becoming increasingly popular, and they require careful engineering considerations to ensure proper functionality. Natural gas conversion drivers include low natural gas prices, more stringent environmental regulations, and operational flexibility. Typical coal to gas conversion candidates are old sub-critical units with smaller that 300 MW capacity and those with little or no air quality control systems in place. Most of these units are located in the eastern US, burning bituminous coals. Conversion (rather than repowering) allows the option of converting back to solid fuel in the future. REI’s extensive experience in boiler CFD modeling, is now combined with steam-side process simulation to guide coal-to-gas conversions. Maintain, mothball, or remove air pollution control devices? REI used a CFD-based model to evaluate the performance of fuel lean gas reburning (FLGR) at Orlando Utilities Commission (OUC) Stanton Unit 1. Gas CoFiring marries natural gas and coal at each burner, injecting through a modified igniter. It also adds a portion of the total heat input as gas in the upper furnace (this is known as Fuel Lean Gas Reburn). The model was first run under “current” operating conditions (coal-firing). The model was then run to evaluate the influence of FLGR on the furnace performance including NOx and CO emissions, penetration and mixing of injected fuel, and impacts on gas temperature. The gas heat input as well as the number and size of the fuel injectors was varied. The simulations showed low model exit NOx and CO emissions and carbon in fly ash compared to the current operation case. Oxy-natural gas firing provides flexible flame temperatures, higher thermal efficiency, very low emissions, and potential for easier CO2 capture. For oxy-firing, the flue gas recycle (FGR) plus oxygen inlet mixture impacts radiant furnace and convective pass heat transfer. The FGR absorbs energy and adds mass flow. The amount of FGR and injection location impact flame temperature and the heat flux profile. The key parameter when comparing the existing air-coal system to the oxy-NG retrofit is the heat transfer distribution in the radiant and convective sections. 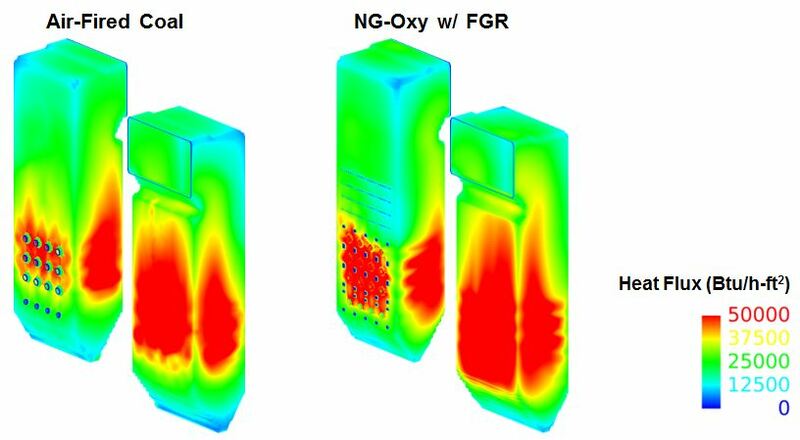 Results showed that oxy-NG firing is feasible for mimicking air-coal fired furnace heat transfer, but the firing system needs to be optimized for specific furnace design. The objective of this project was to provide an initial indication of issues which may arise when switching from coal to natural gas firing. Both process modeling and CFD modeling were performed. A baseline coal-operation steam and flue gas circuit was generated in REI’s process modeling tool, SteamGen Expert. Then another circuit was generated for natural gas firing, in which operating conditions and fouling factors were used to predict heat transfer changes. For this study, the firing rate was increased when switching to natural gas. This produced higher steam and flue gas temperatures. It was determined that the steam flowrate and convective pass surface area would need to be added in order to produce steam comparable to coal-firing. Alternatively, the natural gas firing rate could be decreased until appropriate steam temperatures were reached, but it is likely that changes to the convective sections would still be necessary.